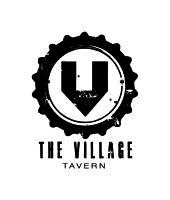 The Village Tavern SA Women’s Football League 2016 Dutschke Medal Night saw almost 260 people come together at the Arkaba Hotel for the night of nights of female football in Adelaide. Thank you to all who attended and a special thank you to the Master of Ceremonies, Ben Hook, who again did a tremendous job. We would like to congratulate the award recipients who are listed below in order of their announcement. Chloe accumulated 55 goals throughout the Minor Rounds. She was ten goals clear of Morphettville Park’s Esther Boles. This is an incredible achievement. Mitzy is only the third player in South Australia to have reached this milestone. 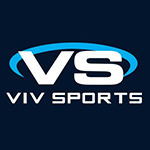 Mitzy is a league Life Member and currently plays for Adelaide University in the Open Women’s Division 1 competition. The Rell Smith Medal is named after Narelle Smith, a SAWFL Life Member who has played over 100 games for the League. After retiring from playing football, Narelle became one of the first female coaches for the Inaugural Female Academy and has continued to work with these Academies each year. She also ran an all-girls AUSKICK Centre at Hectorville and coached the Inaugural Under 18s State Team. The Rell Smith Medal is awarded to the player with the highest number of Umpire Votes in the Under 18 Girls competition. This is the second time Chloe has won this medal, taking home the Rell Smith Medal in 2015. Chloe has had a very successful year in football and was a stand-out player in Modbury’s Under 18 Girls side. Chloe collected 37 votes this season, which was an outstanding 21 votes clear of any other player. She finished the minor rounds just three goals ahead of Adelaide University’s Nicole Collie. This medal is awarded to the Player's Player - the most respected player amongst peers in the competition. The Mulvihill Medal is named after Catherine Mulvihill, who has been a dedicated member of the League as a player and volunteer since its inaugural year in 1991. Catherine’s many achievements in football include being a long-time state representative player, a Life Member of the League, and becoming the first player in the League, and the second player nationally, to reach 300 games. The Mulvihill Medal is awarded to the player with the highest number of Umpire Votes in Open Women’s Division 2 competition. This is Alana’s first Best & Fairest Medal. She collected 32 votes throughout the season, which was an impressive 11 votes ahead of Adelaide University’s Ebony O’Dea and Ellen Maple, Mount Lofty. 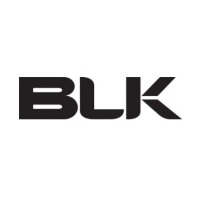 This medal is the League’s Junior Development Award and is sponsored by Life Member, Murray Amos, and Amanda Clarke. This Medal is awarded to the highest ranked youngest player under 18 years in the Open Women’s competition. This is the second time Chloe has won this award, having also won it in 2015. This is fantastic achievement for Chloe, who is just 16 years old. Chloe also took home the 2016 Rell Smith Medal. This medal is named after Deb Pitman who is a Life Member of the League. This award is given to the first year player with the highest number of votes in the Open Women’s competition. She has been a stand out player for Adelaide University this year; she was equal runner- up in the Mulvihill Medal. The Glazbrook Medal was named after Trudy Glazbrook, who at the time was the League's longest running, highest goal kicker. Trudy played for Hectorville and North Adelaide and Greenacres. This Medal is awarded to the player with the highest number of goals kicked in the Open Women’s Division 1 competition. Lexia booted a career-high 20 goals against Ingle Farm in Round 11. This medal was named in memory and honour of Carmel Laube, who played for Edwardstown and represented the State before she was diagnosed with Leukaemia. 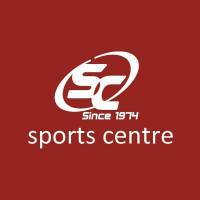 She is fondly remembered for her time and contribution to the League. This is Lilla’s first Carmel Laube Medal. In a normally close competition, Lilla was a stand-out winner. This award is named in honour of Cheryl Cates who was the longest serving President from 2009 to 2013, and in this role she worked exceptionally hard to bring all administrative processes to standard and increase the professionalism of the League. This award seeks to recognise and reward the efforts of volunteers and officials that promote and administer Women's Football. 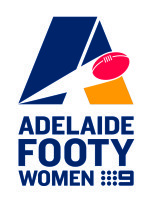 Glenys Killian is the president of the West Adelaide Women’s Football Club. Glenys is also the coordinator and manager of the Open Women’s and U18 West Adelaide Women’s sides which sees her manage all of the administration, registrations and collection of fees. She also heads up the sponsorship department, securing in excess of $15,000 through major sponsorship, players sponsorship and successful grants this season. This award seeks to recognise the efforts of clubs and their volunteers and officials that promote Women's Football and provide a safe, sustainable and professional Club environment. 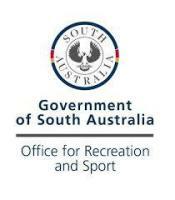 This is the first year that Mount Lofty have been involved with the SAWFL. 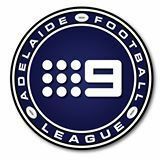 Mount Lofty had 3 players selected in the Adelaide FC invitational squad. The club have a large band of qualified volunteers. Mount Lofty held a number of successful fundraisers and had an increase in sponsorship as a result of introducing a sponsorship coordinator role. 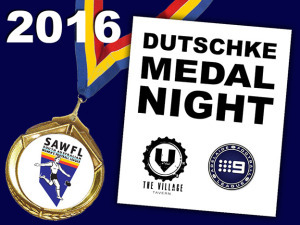 The Dutschke Medal is named after Gina Dutschke who founded the South Australian Women's Football League in 1990. 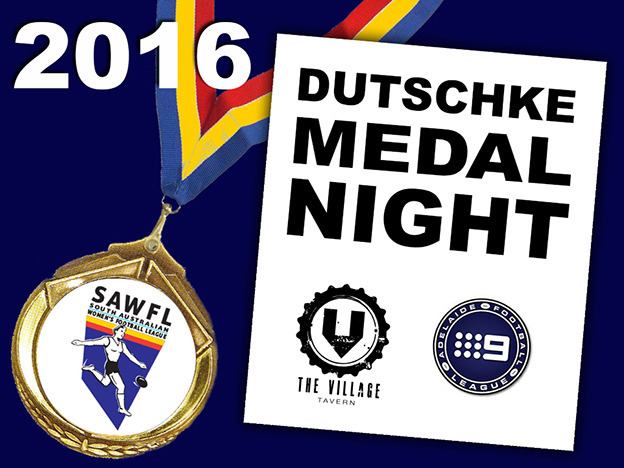 The Dutschke Medal is presented to the Division 1 Best and Fairest Player. Chloe also collected the 2016 Rell Smith Medal, U18 Leading Goal kicker and the Open Women’s Amos and Clarke Medal. Chloe is also an accomplished cricketer who has represented South Australia. Photos of the award recipients are now available on the SAWFL Facebook Page and the complete set of photos from the evening will be available during the week. Photos from the night were taken by License To Shoot Photography.